Sometimes; surprises here come from the most unexpected sources, in this case, both were positive experiences which I couldn’t really have predicted. The run up to the weekend wasn’t brilliant. 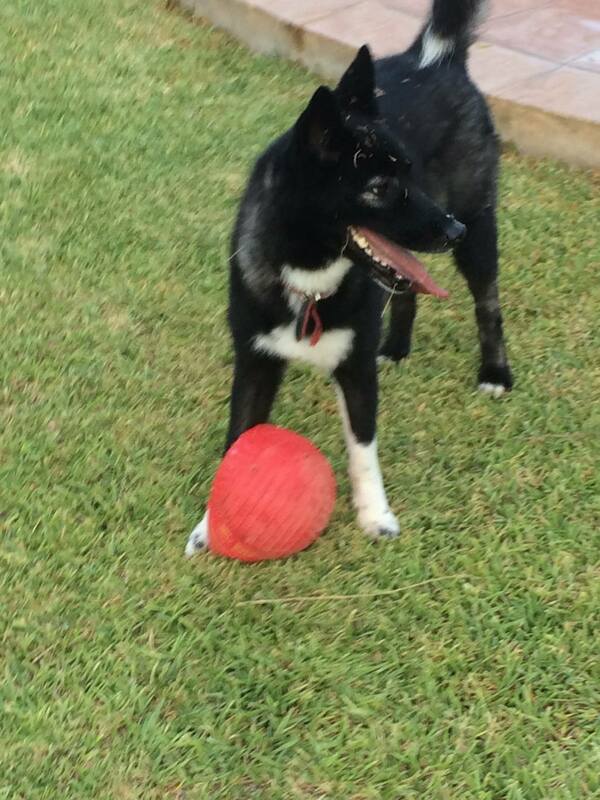 We had a message on Facebook to tell us that Sophie (our dog which is now living with a friend of ours) had escaped. naturally this wasn’t the sort of news you want to wake up to. I did all I could via social media to see if anyone had seen her. To make things worse, there had been one hell of a thunderstorm in Spain that night so all I could think of was poor Sophie. Central FM were brilliant in helping as well as many people sharing the appeal as well as people on Twitter too. Towards the end of the day we had the brilliant news that Sophie had been found. She had been taken in by a lady in Alhaurin and had shelter overnight. I think she had a far better night’s sleep than the rest of us. Late Thursday she was reunited with Jenn who had been desperately looking for her. Katja has received numerous invitations to various birthday parties over the past few months. She has attended most of them and enjoyed every single one of them, lots of stories to tell and new friendships being forged. After all, that’s what life is all about, friendships and experiences. Yesterday, she was invited to go to one of her class-mates birthday party, one of her Qatari friends was having a party at home, the invitation was very specific, NO MEN among other things (I was more than happy to comply and miss out on this!). The map was at best vague, but with some assistance from Google we thought we cracked it. at 07:30 we popped by to see if it was were we though, we found a house which even had a bouncy castle in the garden….happy days, that was easy; or so we thought. We then popped over to do our shopping happy we had “found” our destination for the party. The party was starting at 15:00 hrs; so at 10 to, we headed in that direction. To our frustration and much to my annoyance, it turned out that the house we thought was the right one; wasn’t the right one at all! We drove around the area, asked people and even rang the hosts but to no avail. After over an hour driving around we rang another parent who we knew was going. The seemed to think they knew the way so we met up and followed them. We headed in a totally different area to where we had been looking but we reached a bit of a dead end. This is where we were all pretty amazed with what happened next. One of the people in the car we were following stopped at someone’s house and asked for directions while we waited outside. He was invited in and a few minutes later he came out with another Qatari gentleman. The Qatari gentleman then proceeded to jump into his Land Cruiser and guided us to the correct address. Now, have think about wherever it is you live. Put yourself in this situation. as a foreigner, go to random person’s house with some vague directions asking for help. Would they try and help by giving you directions as best they can? Would they shrug their shoulders and say I don’t know? Or would they jump in their car and guide you and make sure you got there? This morning (Saturday) we popped over to Carrefour to do some shopping, mainly a Christmas, tree, decorations and a few other bits and pieces. We had a walkabout and got all the stuff we needed. As we were wandering around Carrefour there was some poor guy trying to make some announcements regarding their 14th anniversary. I say poor guy because the audio was terrible and kept cutting out, nobody had a clue what he was on about. Anyway, after doing all our shopping we headed off to the checkout, happy with what we had purchased. The poor guy trying to make his announcement was still trying to do so. We were in the midst of having our shopping scanned when all of a sudden the chap at the check out announced that this check out had just been selected as a winner, i was a bit confused as I had no idea what was going on. There was a wheel of fortune of roulette that had been spun and landed on number 19, which was our check out. This meant that whoever was having their shopping scanned at the time on that checkout would get it for free. Well, for a change, we were in the right place at the right time so all our stuff was totally free; quite a nice surprise. After our shopping trip on Friday morning (before the birthday party) we headed to Al Khor to watch the Qatar Mile. This is an event where people with fast cars and bikes go and test their speed on a 1 mile runway. It was great fun. There was also plenty of entertainment for Katja too. We arrived home just as it was starting to rain. We were very excited by this, unfortunately it was only a few drops and literally came to nothing. 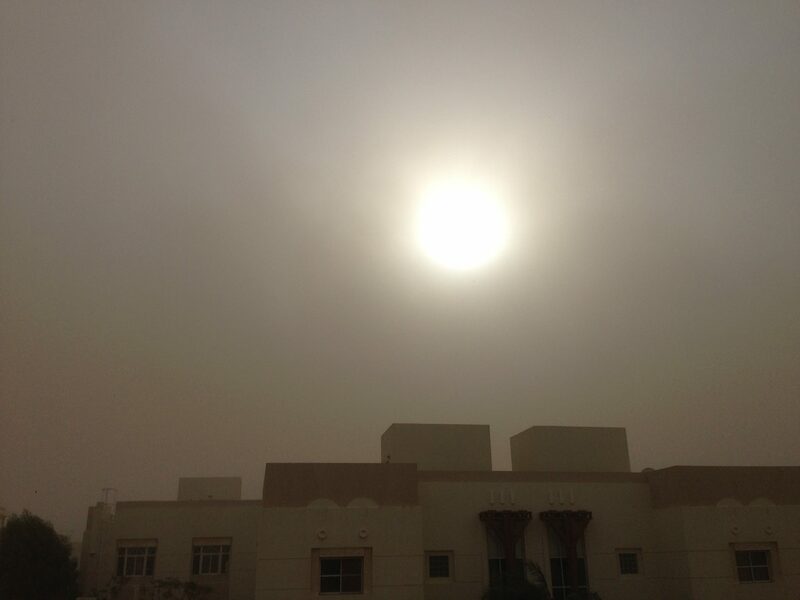 A short while later, the wind picked up and the sky went very dark, it was our first sandstorm! That too passed as quickly as it arrived, here anyway. Friday night (Friday was a busy day!) After the birthday party we went to someone’s apartment for Thanksgiving. We had a fabulous meal accompanied by some lovely people. All in all, a good day was had by all. Yikes, sorry guys, yes, we are still here. I know that in the post which I published just before this one I apologised for my lack of writing lately, but that one was written quite a few weeks ago, I just hadn’t hit the “publish” button” I have had some comments regarding my lack of writing, including someone who shall remain nameless who was complaining they didn’t have their bog blog! In other words….well, I’ll leave you to figure it out for yourselves. Mind you, I was threatened that if I exposed their identity, this person would start a blog and dish out the dirt on me. That would obviously be one hell of a long blog! It’s amazing how time flies. It’s amazing to think we have been here a tad over three months now. It feels like yesterday that we came out of the airport into the most incredible heat and humidity we had ever experienced. It is also pretty amazing how quickly we have settled into life in a place we are proud and happy to call our new home. I fully appreciate that not everybody’s settling in process may have been as smooth as ours, we have had amazing backing which of course makes life a lot easier. In the three months we’ve been here we have sorted out our long term residency (RP), had out Qatari driver’s licences and bought a new car. On the subject of licences; as we both have British driving licences, it was a matter of going to the traffic department which can only be described as an office in palatial surroundings, submit our forms with our eyesight test, pay a small fee and within 15 minutes we both walked out with our Qatari driving licences, how cool is that?! Well, now that the weather has cooled down, we are out and about every opportunity available. We try and go to once new place every weekend. We have found a wide choice of beaches, some are better than others but the general rule of thumb is to get there early! As we are early birds we don’t mind getting to places early. 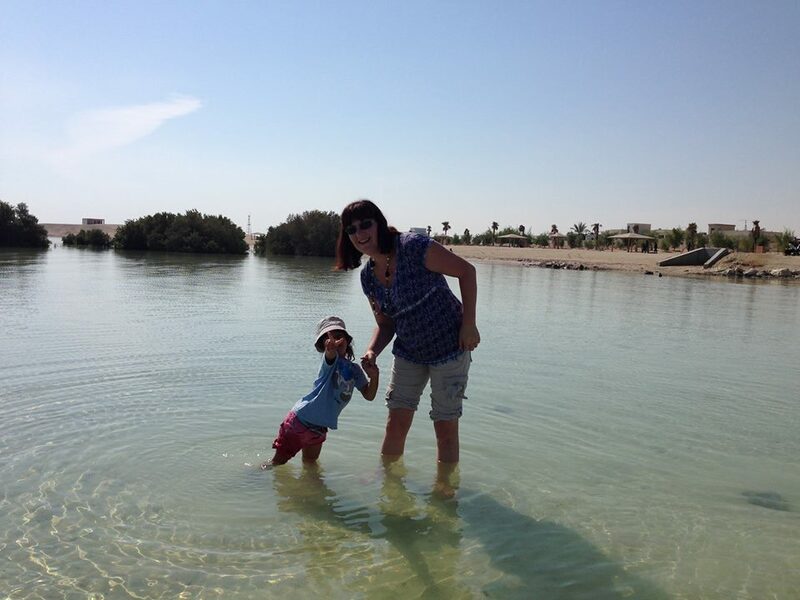 Last week we went to Simaisma Beach which is some 30 km from Doha. 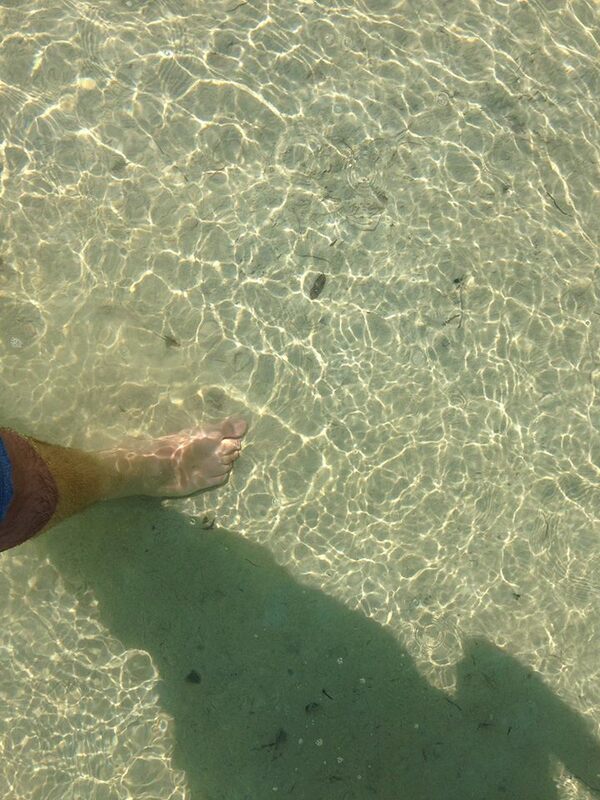 As you can see, the water was amazingly clean! Not only that but it was incredibly shallow, no more than around 3 ft deep! One thing we have learnt, and believe me, “every day is a school day” is that getting changed can be a bit of a challenge so we decided to buy ourselves a tent. Our main tent is on route from the UK so we weren’t about to go and spend crazy money on a tent. 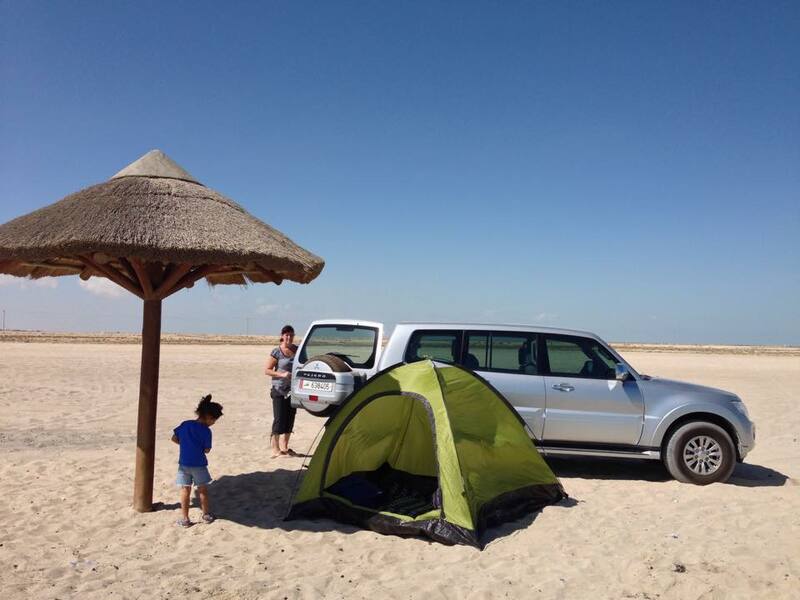 we bought a cheap four man tent from Carrefour which does the trick nicely! unfortunately on our first outing, the wind was so strong (that’s quite rare) that we had to put breeze blocks inside it to keep it in place! Anyway, that sorted out our changing problem. We just need to find better pegs as the ones it came with are rubbish, but hey, you get what you pay for! We are looking forward to putting this and our other tent to good use in the coming months. There are some fab places to go camping and this is the time to do it! I love cycling, I used to as a kid and I do so even more as an adult (me and the word adult in the same sentence don’t really work; but still…) I am hoping to pass on my love of cycling to Kati, we go out together at weekends and do a couple of km around the compound which is a nice and safe environment. Her confidence has grown enormously in recent weeks so today I decided to do away with the stabilizers and hey presto, we have a very confident little girl riding beautifully! The only issue we have is that the breaks on her bike are too hard for her, I spent some time in a bike shop today trying to sort this out but having no luck, they are a bit better but still too hard so we may just need to bite the bullet and get her another bike. 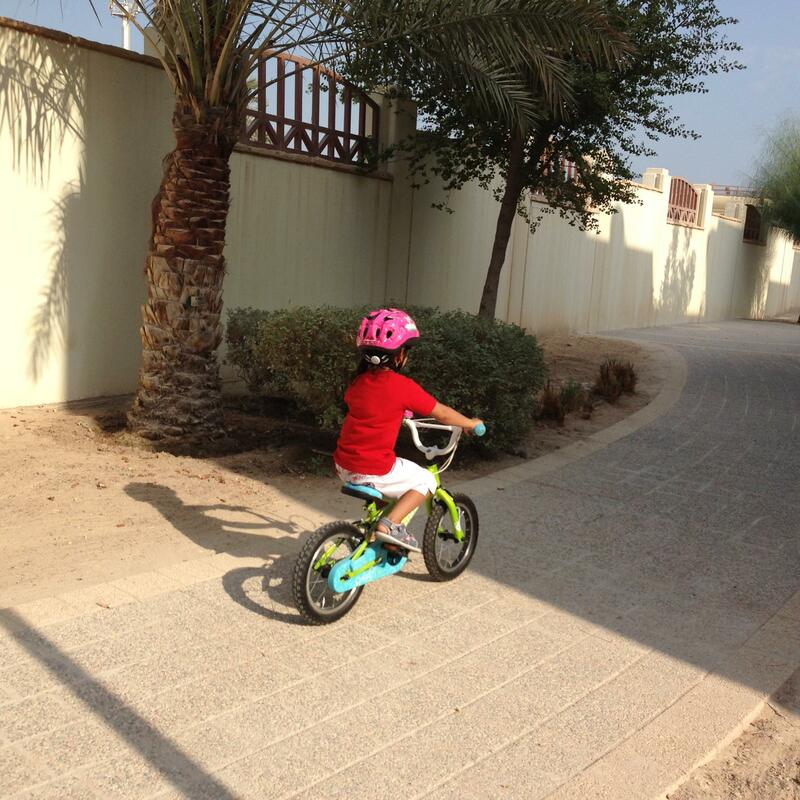 Believe it or not, this is her 3rd bike! First one we bought in Bulgaria and had to sell it as I couldn’t fit it in the car for the drive back to Spain, a couple of weeks before leaving I (stupidly) decided to buy her another one, of course, that one didn’t fit either, so we had to sell that one too and then this one, which we bought in Spain earlier this year. I am very aware that I have been a bit lazy of late and not posted much on the blog; leaving people wondering what have we been up to! The last couple of weeks since I last posted anything have been great fun, lots going on. At my grand old age I should really either write it down straight away or carry pen and paper with me to remind myself of the great places we have been to and the interesting people we have met along the way. Last Friday we popped over to Ash- Shahaniyah to watch the camel races. Well, we popped over on spec not knowing what to expect or see or even if there were any races on. We arrived and as it happens, there was a race in 15 minutes. We went to the entrance to the track which is nothing like a horse track as we had imagined. At the entrance we asked the police who were standing there if we could go in. He looked at us and said “but you don’t have a 4 x 4” something I already knew! Anyway, he agreed to let us in. We drove to the car park which was full of Land Cruiser. We sort of walked aimlessly for a few minutes asking people where the starting point was. It turned out we were parked right in front of it! I am still none the wiser as to what really happens. We just got back into the car and as soon as the camels were off, all the Land Cruisers followed them along the perimeter of the track. We were quite surprised to notice that the there were no jockeys but robots on the back of the camel! Last Thursday we ordered our new car. We opted for a 4 x 4 for several reasons. Firstly, security and safety on the road. Seeing the number of bumps and shunts on the road being in something a little sturdier is a wise idea, extra safety having the spare wheel on the back! Secondly; when our shipment arrives, we will have our tent and what’s left of our camping gear. From what I have researched, there are some pretty cool places for camping which are accessible by 4 x 4 only. Thirdly; space to carry our bikes and bits an pieces. Downside to the car is the model. Whatever possessed Mitsubishi to name it the Pajero really beats me (anyone not knowing what it means click HERE). Katja loves running around and playing gameslike most 4 year olds, so we decided to let her try her hand at rugby! We popped over to the Doha Rugby Club some 6 weeks ago when they had an open day but they wouldn’t accept Katja as she was too young. Poor kid she was quite gutted but fortunately we found a venue that caters for kids her age; so, a couple of weeks ago, she started tag rugby, she is loving it! We bought her a rugby ball and now as the weather is so much cooler, we pop out after tea (we have tea at 16:30) and we have a mess about and she get to practice a bit and get used to things.